Mayfield Garden Centre in Kelso. The Mayfield Garden Centre in Kelso has been granted a drinks licence, despite neighbours’ objections. 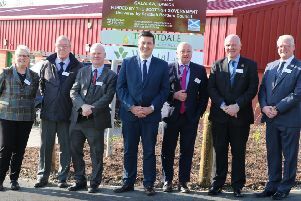 The Scottish Borders Licensing Board unanimously agreed on Friday to approve a new operating plan from the owners of the Tweedside outlet which was expanded last year to include a 200-seater restaurant. The decision will allow the centre to serve alcohol on the premises from 11am till 11pm daily, with off-sales licensed from 10am till 10pm. Assistant manager Carol Purvis told the board the bid was in response to requests from customers who wanted to enjoy a glass of wine with their meal. “These will never go on beyond 9.30pm in the evening,” said Mrs Purvis, stressing that the small off-sales facility would specialise in gift-packs. Mary Rose Gliksten, one of 11 elderly residents of neighbouring Mayfield Gardens who wrote to object to the application, questioned the demand for further licensed premises in Kelso. She reiterated fears that traffic problems created by last year’s expansion of the business would be exacerbated and feared late-night disturbance if functions involving alcohol ran beyond 11pm. She was told by licensing standards officer Ian Tunnah that the operating plan from the centre was typical of many which had been “future-proofed”. This meant if a late-evening function was planned, there would be no need for a fresh licence application. “It’s clear the garden centre is not going to become a drinking den,” observed Kelso councillor Tom Weatherston, who supported the application after hearing that Mr Tunnah and the police would monitor the premises and that any problems would be reported back to the board.